If you’re looking for an app to stay on top of all soccer scores from around the wrold, FotMob for iPhone from Score Service Ltd is a must have. The Soccer Scores Pro app delivers live updating scores for matching from virtually every single professional game being played anywhere in the world in any league you can imagine. There are tons of sports apps like ESPN, BBC, and Fox Soccer just to name a few, but FotMob is probably the only app you’ll find that is dedicated to providing professional soccer scores via an iPhone app. 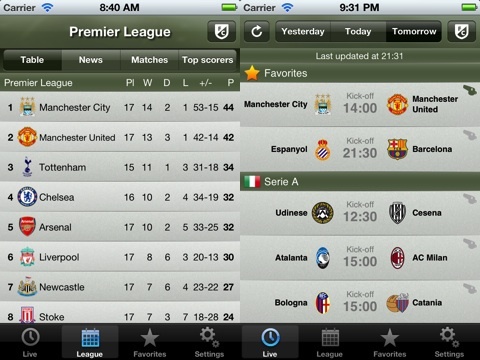 From the main four tabs you can choose to view Live scores, League details, Favorites and Settings for the app. Live is where you can track games being played right now, which includes matches for Today, plus a history of games played Yesterday plus an overview of games coming up Tomorrow. This section can be quickly filtered for leagues by thawing the F/C icon and checking off the ones you want included. Popular leagues including the Premier League, Serie A, LIGA BBVA, Bundesliga, Champions League, Europa League, Euro, World Cup, MLS, and more international leagues are shown above other individual countries in the section called Staff Picks. Speaking of countries, the app covers what seems to be pretty much every single country who has a pro league, plus international series. 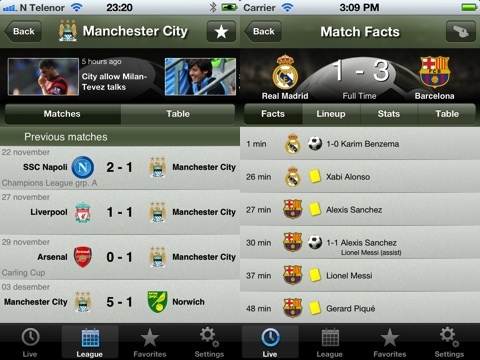 Match Facts is the detail screen where FotMob includes 4 additional sub-sections for keeping up with live and previously played matches. These 4 areas are Facts, Lineup, Stats, and Table. Facts lists goals scored, cards handed out, substitutions and more. Lineup has a nice field/jersey style graphic with player names and subs. Stats is a quick comparison of different statistics about the game such as shots on target, fouls, possession percentage and many more. Table is a standing for the league the game is a part of that shows games played, wins, draws, losses and points. Push notifications can be added to the free app as a premium feature for $1.99 and ads in the app can be removed for $1.99 via in-app purchases. Just be careful, if you’re recording a game and don’t want spoiler alerts, you may not want to enable push alerts. Overall, if you’re at all a fan of soccer (aka football, aka futball) and want to keep up-to-date on matches being played and your favorite teams, FotMob soccer scores is a gem of an app you should not overlook. AppSafari review of Soccer Scores Pro – FotMob was written by Joe Seifi on July 2nd, 2012 and categorized under App Store, Featured, Free, Sports. Page viewed 10051 times, 2 so far today. Need help on using these apps? Please read the Help Page.